Political thinkers believe that the 35A is just a constitutional provision or not legal, political issue has become. [Srinagar]: Jammu and Kashmir continues to act on Article 35A. Kashmir was closed on Sunday on the issue of separatists on this issue. At the same time, there is a hearing on Monday in the Supreme Court on the question of constitutionality. Last year, the Mehbooba Mufti government had urged the state government to stop the trial by refuting the law and order, after citing the decision of the central government to appoint Dineshwar Sharma as the central negotiator and now the local and Panchayat elections in the governor's rule. The two main parties of the state, Mehbooba Mufti's People's Democratic Party (PDP) and Omar Abdullah's National Conference (NC) 35A are against the removal of the BJP, the BJP is in favor, yet why is the party in power at the Center and in the state The Governor is urging the court to avoid hearing. Political analysts believe that the 35A is just a constitutional provision or not legal, political issue has become. For the sake of the Muslim vote bank and the appeasement of separatism is essential. Of the 87 Assembly seats, 37 seats belong to the Jammu division, of which 20 are Muslim voters. In Kashmir Kashmir division and two out of four seats in Ladakh, it is important for the victory of Muslim voters. 95% of Kashmir's population is Muslim. The state of NC and PDP is centered Kashmir. Their political agenda is autonomy and self rule. Congress has left the issue on the court. The BJP is in favor of the removal of 35 A. In the Supreme Court, the organization V. The Citizens' Society has filed a PIL on the issue of 35 A, it is said to be related to the RSS. While in the coalition government, the BJP never took any concrete steps towards ending 370 and 35 A at the local level. State BJP president Ravindra Raina says that 35 A is a fraud. Nobody can remove Western Pak refugees. 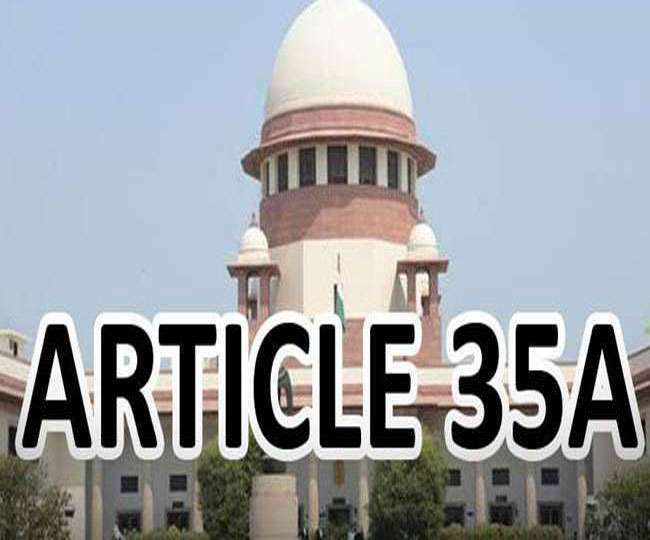 According to Ahmad Ali Fayaz, knower of Kashmir affairs, 370 or 35 A may not dissolve both the central government nor the court, because Kashmiri speaks of the separatists, what they will do in Kashmir, everyone knows. Under the rule of governor NN Vohra, the request to avoid hearing on 35 A has been done only at the behest of the Central Government as it is a representative of the Center. If the court quits 35 A, conditions like 2016 in Kashmir can not be prevented from being born. Mehbooba Mufti has also said this. Better for the governor is that whatever elected government came, the final decision on this subject and take its stand in the court. Kashmiri separatists are not only supported by terrorist organizations, but also 35 A while this article is part of the Indian Constitution, not Jammu and Kashmir Constitution. It will be said that the liberty of Kashmir's freedom brigade will be denied that it denies the Indian Constitution but supports it with its beneficial provisions. The separatists fear that Article 35A will come from different parts of India in Kashmir, most of which will be non-Muslims, and this will weaken the separatist agenda in Kashmir as well as being a Muslim minority in Kashmir. Among those who challenge the highest court in 35 A, Labba Ram Gandhi says that there is no difference between the Congress and the BJP for us. Today, there is a BJP government at the Center, which tells its political agenda to remove 370 and 35 A, but has not taken any practical steps. Former Prime Minister Dr. Manmohan Singh told the local representatives in Jammu in 2014 that I myself am a refugee of western Pakistan, if I were in Jammu and Kashmir, then the prime minister could not even become the head of the village. Labba Ram also confirm this. Article 35A of the Indian Constitution was issued by the then President Dr. Rajendra Prasad on 14th May, 1954 by issuing an order. Through this article, the assembly there has the right to decide the definition of permanent resident of the state. People from Jammu and Kashmir, who come from different parts of the country and from different parts of the country, can buy land in their name or government jobs can not be done in the state. Assembly, local bodies and panchayats neither can contest or vote for vote. Can only vote in the parliamentary elections. Students of this class can not even study in state government's professional colleges.